In many ways, we are all our own physicians, untrained perhaps, but sufficiently savvy to spot things that are ‘different’ with our daily bodily habitus. One of the readers discovered what happens if you ignore warning signs in a very painful way, and sent me the following (and I thank you Richard, I am sure it will help somebody out there). I forgot his words of wisdom, I mean checking the color of one’s poo is not high on the list of ‘Must do things’ is it? About a month ago I stood up and suddenly keeled over, I had been feeling strange for a few days before. I lay on the bed and began shaking very badly as people do in the films just before they are about to die and I thought I was a goner, as I would have been according to the Doctor had my friends not gotten me into hospital in record time. In emergency I suddenly needed a bed pan, and apparently pints of blood came pouring out, more followed. I was in intensive care for five days, nil by mouth and had more drips going into me than my laptop has connections. I was then transferred to the hospital and given a very strong purge to make sure there was no blood leaking into the intestines. The Dr. said aspirin might have contributed to the ulcer, my heart Dr. prescribed an aspirin every day to thin the blood down. I injured my back doing something stupid and another Dr. prescribed some pain killers which also contained aspirin. Too much aspirin seems not to be a good idea! Another five days and I was allowed to go home, my poo having settled down to being the same color as my cornflakes, with strict instructions, only soft food, nothing spicy, no alcohol and to drink plenty of water and strict instructions if my poo was dark at anytime to go straight back to the hospital. I had been taking aspirin along with my blood pressure tablets and the Doctor said to stop taking them as aspirin over a long period could have caused the ulcer. After a month an outpatients visit to the doctor with a sample of my poo and urine, after the results of a blood test, everything was fine, but I still have to follow the first instructions and inspect the color of my poo without fail, not the most interesting part of my day! Another outpatients visit in another month when I hope I will be cleared to eat what I want and enjoy a glass of wine with my dinner. I notice over the years (and that’s a few now) that you frequently put out the call for Belgian chocolates. I have been thinking about sending you some, but where do you get these chocolates? Are you kidding me? Or do you have some sort of learning problem that we shouldn’t speak about? Belgian chocolates come from Belgium! However, here’s a little known secret, there are companies in Bangkok that make Belgian chocolate to original Belgian recipes. There is a Belgian owned company, run by Managing Director Jean-Louis Graindorge who took over the chocolate making business from his father. There you are Henry, I’ve done all the leg-work for you. Now all you have to do is drop a box off at the office, clearly marked “For Hillary Only!” Of course they go down even better with some bubbles, French by choice. Hint, hint, nudge, nudge, nudge, wink, wink. Can you trust a bar girl? Why I ask is that you are telling us to look for the ‘good’ girls, but at my age, I haven’t got the time or effort to be playing the dating game. I did that years ago in my own country and look at all the good that brought me! I’ve met some really nice ones, and they are available, which is more than your ‘nice’ ones. How do we mature guys find the diamonds? Finding diamonds is a bit like panning for gold they tell me. You get a fine sieve and put the stones and gravel in, wash with water, shake a lot, pray even more and if you are very, very lucky you might find a diamond caught in the mesh. It’s a bit hard to do that down at Perfect Match A Go-Go, isn’t it, Alfie my Petal. What you have to remember is that the girls that work in bars are there to make money. That’s their ‘regular’ job, and you are the supplier of that money. Can you trust a bar girl? You can be sure they are good at handling money, the more the merrier, and some of it, or all of it, will be yours! Provided you understand the basis of the relationship with your “available” ladies, and keep your eyes open and your wallet closed, you will be fine. You are just the person I need to sort out a couple of friends in the UK. They came over last year with a pocket of blue diamonds and talk about kids in the candy shop! Since then, Jack, the eldest one has had a heart attack and George, the other fat one looks like he’s next to go. How do I arrange some nice slow times for them? And even some ideas on how I can keep them under control. I don’t want to have to send them home in a wooden box. I’ve told them that they have to slow down, but they’re ignoring that side of things. What’s next? What’s next? Problems I guess! Now, how old are these friends of yours? 22 and 23? It sounds like it, or is it 62 and 63 minus 40 for the Vitamin V they will be taking by the handful when they get here? George, sometimes you can’t help people, and you might be in that situation, my Petal. You know what they are coming over for, so probably the best thing you can do is make sure they have travel insurance! Perhaps arranging that they have the same company for the time they are here might also stop the bull in the china shop! Lots of luck. They’ll need it by the sounds of it. Just a quick question. Where would you suggest we go for our first trip to Thailand? We’re a middle aged couple, but broad minded, and would like to see something of the country in the two weeks we will be there. For a first trip, do it all by the travel agent’s arrangements. Tours will happen and you will be quite safe. I suggest Bangkok (temples and palaces), Chiang Mai (elephants and mountains), Pattaya (nightlife and golf) and Phuket (beaches). Pater has decided to have his Roller shipped over to protect it from the amorous advances of Daisy the Friesian. You would love Daisy, Hillary. Much more cuddly than a buffalo and the best set of teats in the business! Do you honestly think that either the readers or myself are interested in your claims that your father owns a fancy expensive motor car? There would be as much substance in that as all your other claims over the years as far as the chocolates and French fizzwater is concerned. And as far as Daisy the Friesian is concerned, Friesians have always been good milkers, whether they are called Daisy or Dozy (which would be more appropriate for your family, I think). Mistersingha, my Petal, I don’t really know how to say this nicely, but I think you have a severe problem. You should get some professional help. I cannot help you, so no more letters please. Just desist, as I cannot in all conscience expose the readership to this kind of communication. Goodbye Mistersingha. The photographs with this week’s column were sent to me by an old friend, suggesting that they could be useful in one of the photography columns for the newspaper, and when I downloaded them, I could only agree. However, there is much that can be learned from careful study of these photographs, and “perfect timing” is not quite the name of the game here. Let’s look at the first pic. I will, for the sake of the exercise, presume that this is a genuine photograph, and not something that has been ‘photo-shopped’ together to make the final image. 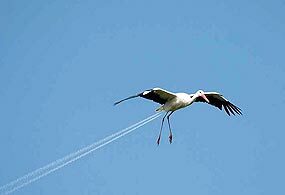 To get the timing right for this shot is almost impossible with the two variables being the jet plane and its contrails and the flight of the crane (or heron). Quite honestly, I believe this is one of those incredibly lucky shots that might occur once in every photographer’s lifetime. Or on the other hand, it probably is Mr. Photo-shop! The second photo is a different situation entirely. 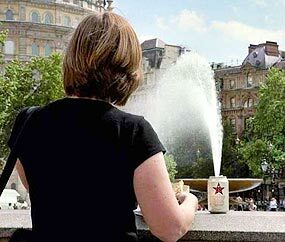 The soft drink can could be placed, relative to the camera and the fountain in the background, to give the impression of the spray coming from the can. However, there are a few problems to be overcome, and the first is depth of field. If the can is in focus and the fountain is not, the impression is immediately lost. This shot requires great depth of field, which would have been accomplished by having a small diameter aperture (which equates to a large f stop number, as always remember that f16 is a smaller aperture size than f 8). Another factor involved in depth of field is the focal length of lens used. A telephoto lens shortens the depth of field, whilst the ‘normal’ lens of around 50 mm and wider (down to 28 mm) will increase the depth of field. Looking at the buildings in the background and the foreground size of the woman and the can, I think this would have been taken with the ‘normal’ focal length of 50 mm. By using that aperture of f 16, the correct exposure for that shot would require a shutter speed of around 1/30 second, and looking at the fountain spray, that would appear to be the shutter speed selected, as it is ‘foamy’ and not crystal sharp. Now, did the photographer go out to get that shot, or did he stumble across it by accident? My guess is that he (or she) went there to take that shot, as the variables in the exposure (aperture and shutter speed) and selected lens are just too much of a coincidence to have happened all at the same time. So what is the lesson for the amateur photographer? Well, the first is to never believe anything you hear and about 50 percent of what you see! The keen photographer should also sit down and work out how any shots are actually accomplished. Some photo books will even state the exposure details of the published shots, so before you go out to try and create some ‘Perfect Timing’ shots of your own, you will have a rough idea of what you want to take, and the necessary mechanics you will need. By the way, I am not suggesting you rush out and slavishly take a foaming can photograph this weekend, but the concept is one worth remembering. There could be many shots with foam sprouting from some object, or even a person, that would have impact. With a cloud formation, you could put that in (apparent) contact with something else. You could get tree branches growing out of someone’s ears. The possibilities are endless, but please don’t wait for flight TG 03 and a homecoming heron! After World War I, the allies imposed Treaty of Versailles on the defeated Germans. The reparations were severe and everyone knew that Germany had very little chance in making the payments. The newly formed Weimar Republic decided the only chance they had was to print money. The value of the Papiermark was 4.2 to one US Dollar in 1914. By late summer 1923 it was one million per dollar. People were forced to carry their money in wheelbarrows when they went shopping. Hyperinflation had hit Germany. To counter this, the Germans had to do what was called a “monetary reset” and brought in the Rentenmark at the old value of 4.2 to the US Dollar. Shocking as though it may seem, it is not impossible that the financial repercussions of the 1920s will not be repeated now. Hyperinflation is becoming more likely every day. This is especially so should the plans of the Fed miss their target or if the Chinese get their way and the US Dollar is no longer considered as the world’s major reserve currency. The chances of the latter happening in the near future are not massive as approximately fifty percent of Chinese reserves are invested in American debt. Also, many of the world’s most important economies are heavily invested in US Dollars. As things are now, the US has nearly USD11 trillion in debt already. And with USD8.5 trillion committed to bailouts and USD3.6 trillion more ready and on the spending table, we are not going to have a shortage of debt any time soon. What will be interesting though is to see how the above nations react to the recent announcement of the Fed to print another USD1 trillion into the American economy via long term government debt. This is something they have not done for over fifty years. Basically, it is making money out of thin air. Just to remind you, the USD, in an experiment dating back to 15th August 1971, is a fiat currency which means that it is not pegged to anything. The Fed controls how many dollars are allowed into the market. It is interesting that now countries know how America plans to respond to the present crisis, they are now calling for governments to consider a new world reserve currency which is actually made up from a basket of currencies. I do not think that this will happen in the near future but it shows how people feel about the US Dollar at the moment. This is reflected in the questioning of the value and future of the Greenback in the media, Chinese ministerial observations, Davos, the G20, academic, financial and industrial research and even in satirical and semi-serious material that almost borders on bathos. 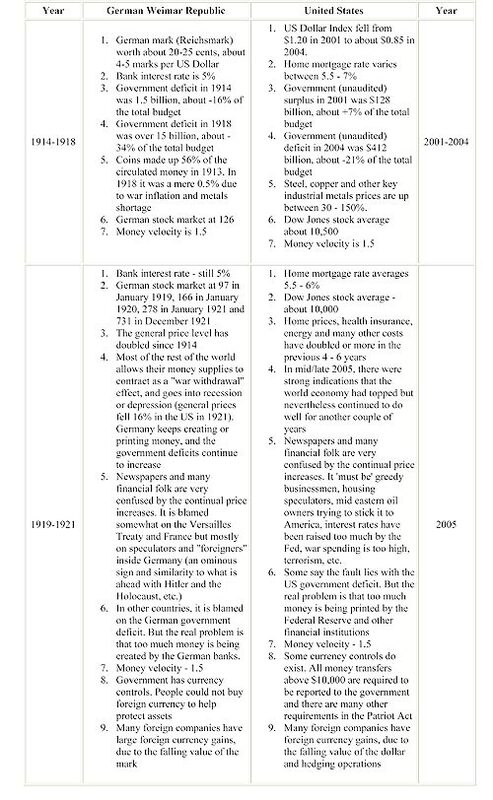 Now, bearing in mind the quotation at the top of the page from President Obama’s Democratic predecessor, let us look at comparisons between Germany in the 1920s and America over eighty years later – the parallel to German war reparations then is derivatives now. And having done that, what about a couple more changes? Sometimes the lawmakers get it right. The news that the Cabinet has approved – just recently – a liberalisation of the ‘rules’ governing film censorship in Thailand is very welcome. I can’t claim to understand fully what chaotic ‘system’ has been in operation during recent times but it has certainly led to some infantile tampering with movies. You will have seen the feeble attempts at pixilation of violence whereby parts of the screen are covered in large dots to save our sensibilities. One film-maker showed his film with black screen where the censor had removed minutes of action. Other films are cut or rejected. It seems to have been arbitrary and ‘master minded’ by people with no connection to cinema. Simply meddling moral guardians. It has now been decided that a classification system will be introduced, similar to that in the UK and no doubt many other countries. There will be a Universal category which signifies no age range and no ‘problems’. For the rest, movies will be graded as suitable for specified ages from 13 upwards. There will still be the possibility of an outright ban, based on the notion of films which are deemed insulting to the monarchy or religion. At least this is a step in the right direction. What is needed, of course, are clearly defined guidelines which are made public and a right of appeal by the film makers. And the Board of Classification needs to be appointed from competent professionals, not busybodies. Grading should not be seen as censorship but as guidance. Of course it all stands or falls at the actual box office. Films in the 15 or 18 category for example will no doubt be seen by boys and girls younger than that, since the box office and ushers will not have time to ask for ID from everyone. If this is attempted the queue at the notoriously slow Airport Major will take 30 to 40 minutes to get through, not the present 10. Most importantly, let’s hope that no film is banned for other than the reasons above. Not for political or sexual or other reasons: only if the film breaks the law and can be shown to have done so. So, please, would the Cabinet like to find time to make two other much needed changes, which bring ridicule to Thailand? The first is the notorious use of double pricing at National Parks and other attractions. This – should you not know – means that farangs are charged far more than Thais, (sometimes 10 times as much), to enter a park or similar place. The result is that many tourists simply refuse to pay or do so and then complain about this afterwards, often when back home. The effect is to further weaken tourism and reinforces the notion that Thailand does not welcome visitors or seeks to rip them off. There’s little need to rehearse the arguments against this unfair and silly and possibly illegal practice. The two tier system is simply wrong. It might be described as racist or prejudiced. It is certainly offensive to visitors and whatever revenue it yields is probably wiped out by those who reject the charges. Time for a change and some simple common sense. And, lastly, what about tidying up the ridiculous licensing laws? I went shopping at Rimping Supermarket near the airport recently and picked up some wine. I recalled that there was an embargo on selling alcohol between 2 p.m. and 5 p.m. but had forgotten that the same rule applies before 11a.m. The idea, I gather, is to protect children, stopping them from getting drunk on the way to school or college or rushing for the booze straight after classes. What an impractical notion. Time for a change here too. Simply allow alcohol to be sold during opening hours and when there is any doubt about the buyer’s age ask for ID. The lawmakers can set the age, (18? ), at which alcohol can be legally bought. It works elsewhere, (e.g. the UK), so why not in Thailand? The rules about not selling alcohol on specific days can still be applied – not that this stops anyone buying it from countless outlets, but that is another matter. Both this anachronisms fall into the same notion as film censorship. They are unfair, impractical and treat people as either less than adults or second rate citizens. Time to let us grow up. And I think the current Prime Minister is the person who may allow us to do just that. Jija - Raging Phoenix [Opens Wednesday]: Thai, Action/ Romance – Martial arts film starring the amazing girl from the film Chocolate, Jija Yanin, a true female action icon, who here combines a stunning martial art style with a love story. Focused specifically to Jija’s skills and personality, the film fuses her martial arts skills with break dancing. Trail of the Panda [Wednesday]: China, Family – A Disney live action film directed by Chinese director Yu Zhong and shot in the wilderness of Wolong, Sichuan (the area that was destroyed during the massive earthquake of May 2008). Trail of the Panda is the story of a panda cub that is separated from its mother and subsequently rescued by an orphaned boy after going through a series of hardships and dangers in the forest. In Country & Melody 2 (E-Som Somwang) [Wednesday]: Thai, Comedy/ Musical – Som and Somwang from the first episode abandon their musical band to pursue their dreams in Bangkok. Somwang gets a job as a singer in a night cafe, and is soon allured by the night life, girls, and fame. The change in Somwang makes Som heartbroken, but the news of Som’s pregnancy seems to reconcile the two. G.I. Joe: The Rise of Cobra: US, Action/ Adventure/ Sci-Fi/ Thriller – From Hasbro the toy-makers we get another action-adventure film based on toys, very much like Transformers: Nonsensical mayhem, and very loud, but stylish. I actually found it more enjoyable than Transformers, which I guess might not be saying much. Wear your earplugs! With Dennis Quaid, Channing Tatum, Sienna Miller, Marlon Wayans. Directed by Stephen Sommers. Early reviews: Mixed or average. Sam Chuk: Thai, Drama – Based on a true story, this is a rarity for Thailand: a thoughtful, well-done social issues film, exploring the lives of seven teenagers who are entangled with and devastated by drug use in a small province called Sam Chuk. Their local teacher tries to teach them to cope with their problems. Affecting performances, choppy storytelling style, a bit sentimental at times, but overall a heart-rending document. I recommend you see it. Directed by Thanit Jintanukul [Tanit Jitnukul]. Director Tanit was born in 1956 in Songkhla Province, and made his name filming historical battle epics, directing a string of them: Bang Rajan, Legend of the Warlord, and Sema: Warrior of Ayutthaya. However, he’s worked in many genres, including horror (Art of the Devil and Narok), crime-action (102 Bangkok Robbery), and comedy (Andaman Girl). He won best director honors at the Thailand National Film Awards for Bang Rajan. The film was also screened at the 2000 Fantasia Festival, where it placed second in the international competition. Bang Rajan was later “presented” by Oliver Stone in a theatrical release in the United States. Definitely a director to follow, and this a film to see. The Taking of Pelham 1 2 3: US/ UK, Crime/ Drama/ Thriller – I found it a thoroughly engrossing and exciting film, and a satisfying dramatic experience. Denzel Washington plays a New York City subway dispatcher whose day is thrown into chaos by an audacious crime: the hijacking of a subway train. The criminal mastermind, beautifully played by John Travolta, is the leader of a gang of four who threatens to execute the train’s passengers unless a large ransom is paid within one hour. A reworking of the 1974 film. Rated R in the US for violence and pervasive language. Mixed or average reviews. 6:66 Death Happens / 6:66 Die Not Die / tai mai dai tai: Thai, Horror – A crime reporter starts seeing weird and scary things after someone who was supposed to die doesn’t die, causing a rip in the fabric between life and death, or something like that. A dreadful movie, to gauge from the previews and posters. I choose not to see it. Dear Galileo: Thai, Comedy/ Drama – A pleasant enough diversion about girls on their own in Europe – low-keyed and low-powered, slow and meandering. From Nithiwat Tharathorn, continuing his examination of students in love as two teenage Thai girls spend a year in London, Paris, and Rome. When they run short of money, they get jobs in Thai restaurants for a while. Based on the director’s own experiences of living and working abroad. Harry Potter and the Half-Blood Prince: US/ UK, Adventure/ Fantasy/ Romance – This, the latest and darkest Harry Potter episode, is a dazzling film, with brilliant cinematography, fantastic effects, and moments of emotional power. I think you’ll find it incoherent unless you’re a close follower of the previous films, or have immersed yourself in the books. If not, large sections of the film will make absolutely no sense whatsoever, because all the characters seem to know things the audience is never privy to. Great art direction and scenic design, and it’s really well directed, with excellent performances, and an exciting story. Generally favorable reviews. North’s 2S bid is minor suit Stayman, just like regular Stayman except that you are asking for the no trump opener’s four card minor, rather than asking about a four card major. East’s double asks for a spade lead. West obediently led the ten of spades. Imagine you are sitting South. Even after looking at the diagram below you do not know the location of the queen of diamonds. What is your plan to make the contract no matter who has this queen? Finally, lead the queen of spades. East is forced to win and then has a choice of ways to give you the contract. A diamond lead into the ace jack gives you the two more diamond tricks you need, whoever has the queen. Any other lead allows you to sluff a diamond from hand and ruff on board. Twelve tricks bid and made. The key card is North’s queen of spades, which might appear useless being under the king, but which allows you to put East on lead at the end. Would your plan have made the contract?